Three spacecraft that will study Earth from above were carried aloft Tuesday aboard a Boeing Delta 2 rocket including one that promises to make future remote sensing satellites faster, better and cheaper. Liftoff occurred at exactly 1824:25 GMT (1:24:25 p.m. EST) from Vandenberg Air Force Base in California, marking the start of the 282nd flight for the Delta family of rockets dating back 40 years. The rocket darted into the clear blue sky, heading southward to reach an orbit around Earth's poles. It was a marathon mission for the Delta 2 lasting an hour and 50 minutes from start to finish with multiple burns of the upper stage motor and deployment of the three satellite cargos. 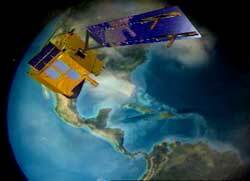 First released was NASA's Earth Observing-1, a technology demonstration craft from the space agency's New Millennium Program. The $193 million mission seeks to prove the utility of advanced Earth-imaging instruments that could be employed by the next generation of Landsat-type remote sensing craft. The Landsat program has documented the ever changing global environment on Earth for three decades, giving scientists a window through which they can monitor pollution, urban sprawl, crop stress, forestry, agriculture, oceanography, natural disasters and resource distribution. EO-1 carries a suite of two imaging instruments along with a device that will remove the distorting effects of the atmosphere. The purpose of New Millennium Program missions, of which EO-1 is the third following the Deep Space-1 and -2 probes, is to test the capabilities of risky new technologies in orbit to ensure they work before incorporating them into real science satellites. To check EO-1's imaging eyes, the craft will rendezvous with the Landsat 7 satellite currently orbiting the Earth in about three weeks. EO-1 will fly one minute behind Landsat 7, snapping pictures of the same swaths of the planet's surface so scientists can directly compare the images. "Although many engineering tests will be performed on the EO-1 technologies to measure performance, the proof of the pudding is in the eating," said Stephen Ungar, the project scientist. "A panel of 87 distinguished scientists have been selected by NASA to perform 31 science investigations to demonstrate how effective a base the EO-1 instrument suite will provide for future Earth observing missions." NASA and scientists hope the EO-1 technologies live up to expectations because the craft's sophisticated camera system uses one-fourth the power and has one-fourth the mass and weight of the counterpart imager on Landsat 7. It is also 40 percent cheaper and should be able to resolve finer details in its pictures that are currently just noise in Landsat data. "A smaller instrument requires smaller spacecraft and they in turn require a smaller launch vehicle and the smaller mission can be built on a smaller schedule," said Bryant Cramer, the New Millennium Program manager at NASA's Goddard Space Flight Center. In addition to the imagers and atmospheric corrector, there are five other advanced technologies aboard including a pulse plasma thruster, lightweight flexible solar array, carbon-carbon heat radiator, X-band phased array antenna and enhanced formation flying software that will allow the craft to control itself in order to keep within three kilometers of Landsat 7. Joining EO-1 on the ride to orbit was the Argentine Satelite de Aplicanciones Cientificas-C, or SAC-C, spacecraft with its 11 instruments. The satellite is set to explore the Earth's magnetic field and its interaction with the stream of particles from the sun called the solar wind, as well as study the ionosphere and geomagnetic field and serve as an orbital relay station to track the endangered Franca whale. Global Positioning System receives will be attached to the whales' backs. When they surface and the satellite happens to be flying overhead, the whales' precise locations will be noted so researchers can understand the migratory route in the Atlantic Ocean. "This requires the cooperation of these whales, and hopefully over the lifetime of this mission, which is about four years, we hope to track the migratory path of these whales," John LaBrecque, the NASA program scientist for SAC-C. The $45 million SAC-C mission is an international venture between the Argentine Commission on Space Activities, NASA, Brazil, Denmark, France and Italy. The launch served as the inaugural flight of Boeing's new satellite dispensing system that allows two distinctly different spacecraft to share the journey to orbit. The EO-1 and SAC-C satellites were originally planned to be launched aboard a less powerful Orbital Sciences-built Taurus rocket. But when they became too heavy during development, NASA was forced into option of launching them separately on two Taurus rockets. As a result, the space agency went to Boeing with the idea of designing a structure whereby one craft could be stacked atop the other and flown aboard the highly reliable Delta 2 rocket. The so-called Dual Payload Attach Fitting was born, and with it the opportunity for Boeing to enter the small satellite launching market against competitors like Orbital's Taurus and Lockheed Martin's Athena rockets. The Delta 2 offers to launch two smaller satellites at one shot when the other vehicles can only boost one. The European aerospace firm Astrium designed and built the DPAF for Boeing, taking the heritage from the Ariane 4 rocket's Spelda dual satellite system. Looking much like a barrel with cone-shaped ends, the DPAF allowed EO-1 to be attached atop the structure with SAC-C enclosed within the cylinder. With the successful debut Tuesday, DPAF will be used again next spring when the Jason and TIMED satellites are launched for NASA on a Delta 2 from Vandenberg. A slightly different version will then fly next December to carry NASA's ICESAT and CATSAT spacecraft. Boeing engineers are also studying the concept for the next-generation Delta 4 rocket to launch two commercial communications satellites at one time like Arianespace's Ariane 4 rocket has done for so many years. One hour after liftoff Tuesday, while flying over southeast Africa, EO-1 was released on its own. The cylinder and top cone of DPAF was jettisoned about 14 minutes later to reveal SAC-C for the first time. 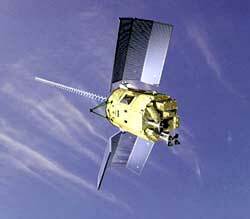 After an orbit-changing burn by the second stage, the SAC-C craft was deployed 91 minutes over the Arctic Circle. The Delta 2's mission ended almost two hours after it began when the spent second stage ejected the tiny Munin nanosatellite while southeast of Hawaii near the equator having spanned a complete orbit of the Earth. Named after one of the Nordic God Odin's ravens, the hitchhiker payload was designed and built by the Swedish Institute of Space Physics in cooperation with students at Umea University and Lulea University in Sweden. 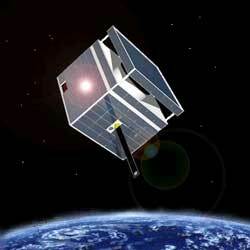 The cube satellite is designed to collect data on space weather and auroral activity in the northern and southern hemispheres, while testing the concept of small satellites operating autonomously in orbit. 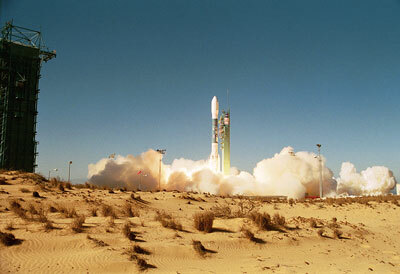 Tuesday's launch was the seventh and final Delta flight of 2000. Spaceflight Now looks back to Tuesday's flight of the Boeing Delta 2 rocket for NASA with a gallery of spectacular launch photographs. The Boeing Delta 2 rocket lifts off from Vandenberg Air Force Base in California with the Earth Observing-1, SAC-C and Munin satellites. A remotely controlled tracking camera located near the launch pad tracks the Delta 2 rocket as it blasts away from Vandenberg. The three strap-on solid rocket motors are jettisoned to fall into the Pacific as the vehicle begins a "dog-leg maneuver" to change trajectory. An infrared camera shows the first stage main engine and vernier thrusters cutting off, followed by stage separation and ignition of the second stage. Delta 2 rocket - Overview of the Delta 2 7320-model rocket used for this launch. 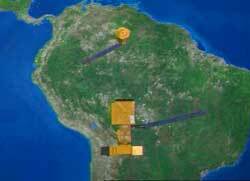 Earth Observing-1 - Learn more about this NASA satellite and its futuristic technologies. 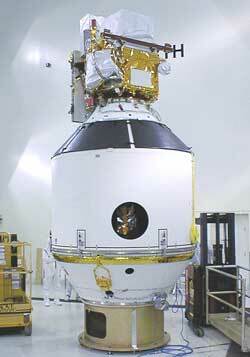 SAC-C - The Argentine scientific research spacecraft that is the co-primary payload of this launch. Spaceflight Now visited the Delta 2 rocket's pad at Vandenberg Air Force Base earlier this year and produced a full 360-degree panorama.